Jim Ellison kept a careful eye on traffic as he turned left into the parking lot for the Cascade Sports Arena. His partner, Blair Sandburg, was listening closely to the radio. "And that was the story in Portland last night as once again the sensational Dwight Roshman comes through for the Jags' second straight win on the Rapids' home court." "Roshman is such a glory hog," Blair snorted. "You've been doing nothing but complaining about that all morning, Chief." Jim glanced at his partner. "He's a great player." "But he's not a team player," Blair pointed out. "Today the Jags are back in Cascade. With two wins already in hand, they're heavily favored to sweep their best-of-five series with Portland." Blair grunted as he turned the radio off. Then he waited until Jim parked the truck close to the back entrance. "And what's with this truck, man?" "They don't build them like this anymore," Jim proudly pointed out. "This baby's made of good ol '60's sheet metal." Blair smirked. "I would have thought you'd have gotten this year's model." "So did I until my insurance agent said I'd have to take out a second mortgage to pay the premiums," Jim admitted. "Simon told me I could forget about filing for line-of-duty compensation." As they got out of the truck, Jim fondly patted the hood. "Two cars totaled in two years. I figured this truck would hold up better. And if it gets totaled, my out-of-pocket expenses are minimal." "Uh-huh." Blair nodded, eyes narrowed. "All she needs is a little TLC," Jim assured him. "Uh-huh." Blair nodded again. "I never would have pegged you as a retro." "I'll have you know 1969 was a very good year for me," Jim protested. "Hey, that's the year I was born," Blair grinned. "It was still a good year for me," Jim shot back. Blair followed his partner into the darkened arena. Now why was 1969 such a good year for you, Jim? Inquiring minds want to know! 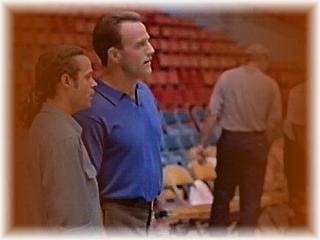 He followed Jim through the arena until they found themselves courtside, watching the Jags players begin practice. "Man, this place looks completely different when there's no one here." Blair looked around in awe at the darkened seats. Then he spotted three of the Jags cheerleaders who were practicing nearby. Catching their eyes, he waved. "Hi, ladies. How are you doing?" Jim grabbed Blair's shirt and pulled him away. "Listen to me. Sitting in on a Jags practice is a privilege. Now behave." Blair chuckled. "I know, Jim, I know. How'd you swing this anyway?" "Thank Simon," Jim answered. He turned his attention to the players who were running up and down the court. "He set it up through Arthur Dell." "Simon knows the Jags' owner?" Blair's eyes widened. "Can he get playoff tickets?" Jim shook his head. "Sold out weeks ago." Blair frowned then shrugged. "Hey, this is better anyway." Jim tore his eyes away from the scrimmage to see a middle-aged man with graying brown hair. "I'm Arthur Dell." The man held out his hand. "Mr. Dell, nice to meet you." Jim shook the man's hand. "Captain Banks sends his regards." He indicated Blair. "This is my partner, Blair Sandburg." "Pleasure to meet you." Blair gripped Dell's hand. "This is such an honor. I've been a Jags fan for so long." "Glad to hear it." Dell smiled. He indicated the man behind him. "This is Ray Krause, head of arena security." "Call me Ray." Krause smiled. "Glad to meet you." "If you need anything, just ask Ray," Dell advised. "Enjoy yourselves." "Thank you again," Jim replied as Dell walked away. "We've met before, haven't we?" Blair asked with a half-frown. "No, I don't think so." the dark-skinned man shook his head. Jim, watching the players, only kept half an ear on the conversation. "I remember! At the University. Outside the coach's office." Blair snapped his fingers. "You're the point guard at the display case with all the trophies." "Yeah, that was me," Krause admitted with a chuckle. "You went pro right after college," Blair continued. "Sandburg!" Jim snapped, finally listening to his partner. "It's okay, Detective," Krause assured him. "He probably doesn't remember. I was going to be a first-round draft pick. The last night of finals I was heading up to my dorm room. The light was out in the hallway and bam!" He slammed his right fist into his left hand. "Went down a full flight of stairs. Left elbow and right knee smashed." "Oh, gosh, I'm so sorry," Blair apologized. "Forget it." Krause shrugged. "I have. Probably for the best. I ended up with a job that's good past the age of 35." He glanced to where the coach had called a break. "Would you like to meet some of the players?" "Can we?" Blair excitedly asked. "Sure." Krause approached a tall young man. "Hey, Dwight. You got a minute to meet some of your fans?" "What do you think?" Dwight Roshman swaggered past them. "Don’t mind Dwight. He just likes to stay focused. Distractions irritate him." "Orvelle Wallace." Blair's eyes widened. Jim curiously eyed the younger man. Sounds like he just saw Santa Claus or something. "Orvelle, this is Detective Jim Ellison and Blair Sandburg," Krause introduced. "Nice to meet you." Orvelle held out his hand. "It's an honor," Blair assured him as he gingerly shook the man's hand. Krause's cell phone rang and he excused himself. "Krause," he answered as he walked away. "You are my favorite player of all time," Blair told Orvelle. "I've still got a card you signed for me when I was 13." "Thanks for making me feel my age," Orvelle joked. "No, no, no," Blair shook his head. "It was the last year you played in Houston." Orvelle smiled. "Not one of my favorite memories," he admitted. "I don't know who was happier when I graduated from the University of Houston. Me or the coach." "I'm sure this is just practice to you, but to me…meeting you is something really special," Blair hesitantly explained. Jim curiously eyed his partner. Kid's got quite a case of hero worship. "It's still special to me," Orvelle confided with a grin. He heard the coach yell and apologized, "Excuse me. Gotta get back to work. It was nice meeting you both." "Wow," Blair murmured under his breath as he watched Orvelle trot across the court. "Is he a class act or what? See, that's what Roshman should be like." "I can't argue with that, Chief," Jim admitted. He watched as Roshman grabbed the ball and ran down the court. "Guy's got a real attitude problem. And all his talk about wanting to be traded. And with Wallace retiring next year, it's not looking good for next season." "That's not the worst of it." Blair shook his head. "I heard if Roshman gets his wish to be traded, Dell's thinking of selling the team." "If the Jags leave Cascade, this city is losing a big part of its history." Jim sadly nodded. "Like when the Browns left Cleveland," Blair recalled "Better break out the riot gear." He shook his head. "Jeez, look at Roshman." Jim's eyes narrowed as he watched Roshman hog the ball. Several of his teammates were shouting they were open, but the big center refused to acknowledge them. As the coach yelled for a pass, one of the defending players stepped into the big center's path. Both players fell sprawling to the floor. "Come on, man! What are you doing?" Roshman angrily demanded as he got to his feet. "Trying to put the franchise on the disabled list? I had a free lane." "And I was defending. Franchise." Keenan Lang sneered. "This is bull…" Roshman snapped. "I'm not listening to you!" Lang yelled as he turned away. "Guys, chill out." Orvelle edged between them. He put a hand on both men's arms. "Get off me, Wallace!" Roshman shouted as he shoved Orvelle away. The older player stumbled, wincing as he turned his ankle. "Oh, man, what does he think he's doing?" Blair edged closer to the court. Jim quickly caught his arm and extended his hearing. "Dwight, it's just a scrimmage," Orvelle pointed out. "This game getting too physical for you, old man?" Roshman sneered. "You need your cane and chair?" Orvelle stared at the younger man. "I ought to do the game a favor and just take you out," he angrily shot back. "Any time you think you can get the job done, grandpa," Roshman cockily retorted. "Any time." Coach Egeland muscled his way through the players. "Enough!" He looked at Orvelle. "You okay?" "Yeah, I'm fine." Orvelle nodded. "All of you! Get on the line!" Egeland shouted. Then he motioned for Krause. Blair anxiously watched as Orvelle limped towards the foul line. "That the same ankle he injured a few years ago." Krause walked towards them. "I hate to say this, but practice is closed the rest of the day," he apologized. "We understand." Jim nodded. "We appreciate what we got to see." "Is everybody okay?" Blair worriedly asked, glancing again at Orvelle. "Oh, yeah," Krause assured him with a grin. "Everybody's just wired for the game. Playoffs do that." Roshman turned to see Jerome Burke, one of the gophers. "What?" he demanded. "You've got some reporters waiting out there for you," Jerome confided. "I don't need any reporters asking me stupid questions," Roshman grumbled. He took a deep breath and tossed his car keys at the younger man. "You're going to be my decoy tonight. Bring my car around to the side, and I'll meet you there." Jerome's dark eyes widened in eagerness. "Cool, man." Roshman tossed him his team jacket. "Wear that. And pull up the hood." Man, I don't know why everybody's on Roshman's back all the time, Jerome silently grumbled as he entered the garage. He's a great player… best the Jags could have. They just need to treat him better. He's always treated me okay. He jingled the keys in his hand as he reached Roshman's car. He never saw the figure standing in the shadows who pointed the gun at the back of his head.